Synopsis: After their plane crashes into uncharted territory in the snowy Himalayan Mountains, the surviving members of a college football team led by quarterback Peyton Marino set out to find help in a freezing cold blizzard. As days pass with no rescue in sight, food and morale run low and some of the survivors, including team manager Sarah (Carly Pope) battle their consciences as they make the heartrending decision that in order to survive, they must use the dead bodies of their teammates as a food source. But their biggest danger is lurking nearby; a hungry beast that stalks them with an insatiable bloodlust. The Yeti. Hot on a distress call, mountain rangers Sheppard (Peter DeLuise) and Fury (Ona Grauer) scale the treacherous mountain side to locate the survivors before they succumb to the elements or become the latest victims of the ancient creature. Arriving at the base camp they find those that remain and learn that Sarah has been taken away by the snow beast. With only a few hours of daylight left in the day, the group struggle along the rocky cliffs in a desperate search to find Sarah. Coming face to face with the Yeti, they battle it out in hopes of making it to a helicopter rendezvous that will save them from this snowy hell. 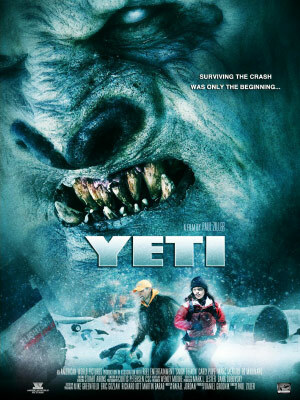 But with the Yeti fiercely killing them one by one, can they make it to the mountain top in time to escape?